What started out as a cocktail function in her backyard was soon turned into a dream wedding day with a radiant bride and her handsome groom. Glenda was one of those brides who started as a client and soon became a friend. I managed to get her into a fairy tale wedding dress and even throw confetti on her special day…. Her warmth is something which radiates from the time you meet her and she never stopped smiling. 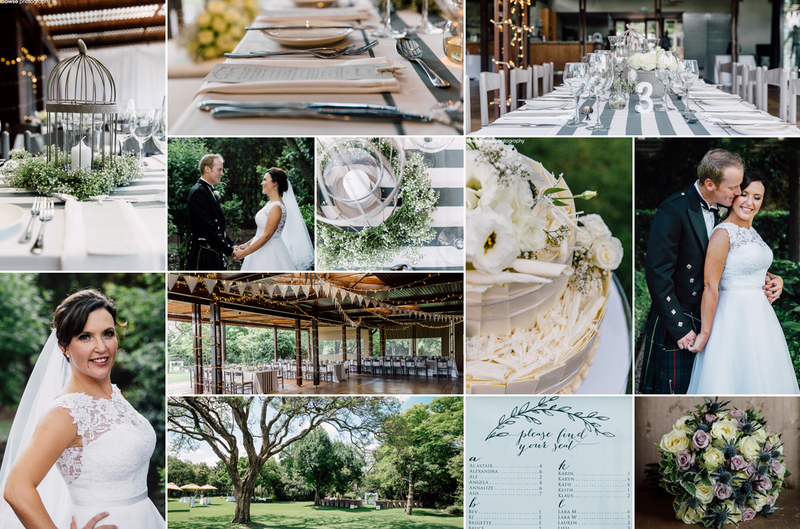 The garden setting at the Longmeadow venue in Fourways gave this wedding the relaxed and romantic feel we were after. I remember the dark clouds moving over just before the ceremony and I am so pleased we held out for 20 minutes in time for the rain to clear and the most beautiful sun to shine down as she walked down the aisle. Her flowers and décor included a chic country feeling with pretty birdcages and grey and white striped runners. The fairy lights adorned the ceiling in the venue and added to the atmosphere and beautiful light. It was an evening of celebration and everyone both young and old danced, laughed and enjoyed the incredible food and atmosphere created at the reception that night. I loved the groom and the groomsmen in their kilts offset by the gorgeous bridesmaids in their navy dresses. The brides and bridesmaids bouquets were made by a special family friend as well as the delicious wedding cake.